In Gameloft’s Starfront: Collision, you command one of three races locked in futuristic sci-fi combat. With each race vying for control of the mysterious Xenodium crystals, you'll need cunning and quickness to excel in this mobile real time strategy game. The races consist of humans known as the Consortium, an alien race called the Myriad, and a sentient robot race called the Wardens. If the game’s name didn’t already ring a bell with RTS fans, the gameplay certainly will. Call it a blatant copy or an homage—the designers definitely had Starcraft in mind when they created Starfront. And if you're going to imitate, you might as well imitate the best. Starfront doesn't achieve quite the refinement of a Blizzard title, but as a mobile stand-in for the franchise, it's a surprisingly fun and easy-to-pick-up title. I could really use some bug spray at this moment. If you’re curious why these three races can’t just get along, tackle the single-player campaign. You’ll start as the humans before unlocking the Myriad and the Wardens missions. Each of the twenty missions follows a narrated story complete with cut-scenes and details worthy of console or PC games. 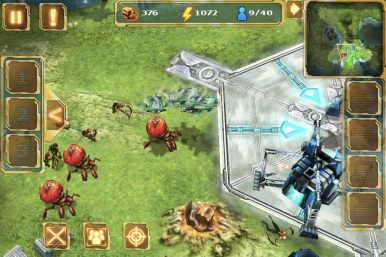 The gameplay, despite being on a mobile platform, is also typical of RTS games. You'll mine minerals to construct buildings and train armies with whom you’ll accomplish your objectives—usually defeating the enemy races. RTS games often succeed or fail based upon their interfaces, and the small screen on an iPhone or iPod touch makes this an extra challenge. Starfront does an excellent job by giving you instant access to necessary controls and status information. You can hide and reveal menus as you need them freeing much of the screen for the impressive visuals. Touch screens are made for RTS games, and once you’ve learned to use more than one finger, you’ll be tapping your units around the maps with the greatest of ease. Unfortunately, Starfront is not native to the iPad—a major oversight by Gameloft in my opinion. Gameplay extends well beyond the extensive campaign. In skirmish mode, you can create your own single-player battles, and the different multiplayer options give you unlimited replay. There are five different multiplayer maps for up to four-player battles online through Gameloft’s service or local via wifi or bluetooth. Whatever game mode you select, the action is intense and smooth even with dozens of units at play. With no official Starcraft for iOS, Starfront is the next best thing. A rich storyline, intricate 3D visuals, an awesome interface, and tons of replay make Starfront an RTS achievement. Gameloft did something a little differently with the pricing of Starfront. The free version only gives you a taste of the gameplay reserving the campaign and multiplayer for a $6.99 in-app purchase. Due to this, multiple purchases are required if you wish to install it on more than one iOS device on your account. Starfront: Collision is compatible with iPhone 3GS, iPhone 4, iPod touch (3rd or 4th gen) and iPad running iOS 3.1.3 or later.